A substantial number of savvy financial players never had any faith the Tribune Co. would be sold at a premium price, according to an analysis of trading data for the last 12 months. Although Tribune’s stock took a bit of a hopeful leap in June after the disgruntled Chandler family put the company into play, a hefty 39.4% of the company’s shares were sold short at the same time. Short sales occur when sophisticated investors sell stock they don’t own in hopes of purchasing the shares necessary to cover their positions when the stock’s price falls at a later date. If a lot of investors think a stock is overpriced, the percentage of short shares rises. 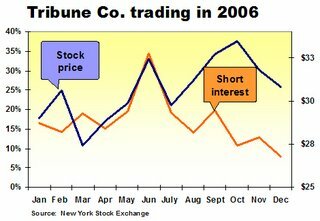 As illustrated in the chart below, the short interest in Tribune peaked in June. The shorts were more scarce when the stock price surged in October and short interested declined for the balance of the year as the stock eased to its present trading range. Short interest was 7.9%, on Dec. 8, 2006. The Tribune’s year-end short interest, which is the most recent available, stands in contrast to short percentages of 2.2% for Gannett and 4.5% at McClatchy.